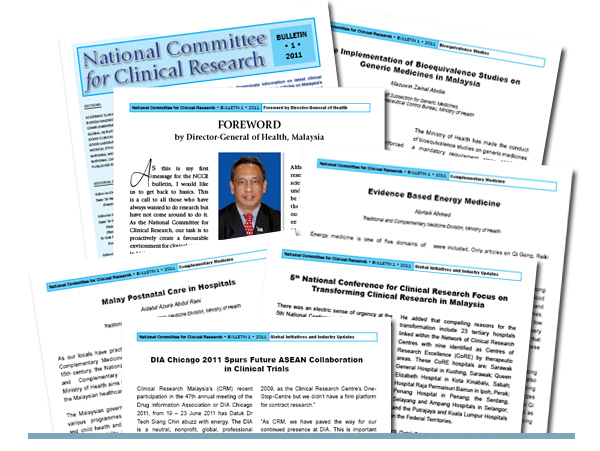 In this issue we feature Malaysia’s move of implementing bioequivalence study requirements for generic medicines, the launch and promotion of Clinical Research Malaysia to promote clinical research and the highlights from this year’s National Conference for Clinical Research. We also discussed the lack of conclusive evidence for the therapeutic use of energy medicine and the potential of Malay postnatal care in hospitals. Finally, we included a review on Epstein Barr virus (EBV) and non-EBV related lab-based diagnosis tests for nasopharyngeal carcinoma.